Alex Toland: Wishgarden- Flooded harvest from MoTA - Museum of Transitory Art on Vimeo. 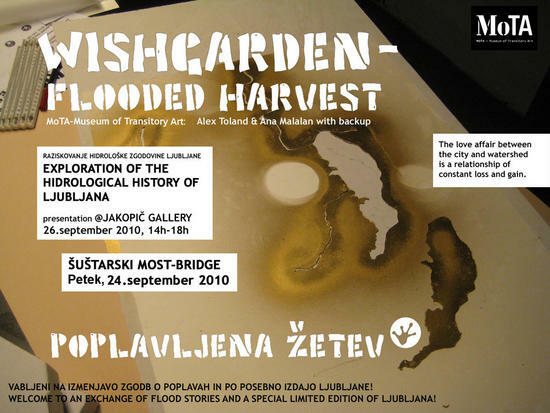 Due to a special situation in Ljubljana – the flood, the project was built as a response to this enviromental situation. The author wanted to expose the natural riverbed of the river Ljubljanica. We installed a soil drawing on a bridge in the city center and also produced a hacked tourist map of the city. The idea was to make people think of the changes that people made of the natural way of the river and also the changes that the river made with the flooding. On the back of the maps there were some tips and points of how we could emprove and re-think the waterways in the future to reduce the damage coused by the floods. The presentation consisted of the explanation of the changes of the river bed and presentation of the idea of the project ‘Flooded harvest’. Alex Toland is an American born artist, currently based in Berlin. Her interests include land art, landscape architecture, soil protection, environmental ethics, ecology, and ethno-botany, as well as urban planning and social science. She employs a wide range of organic, found, recycled and traditional art materials in her installation work, sculptures, digital images, audio sculptures and group actions. She believes that art is an invaluable instrument to teach and inform the public about environmental and social issues.